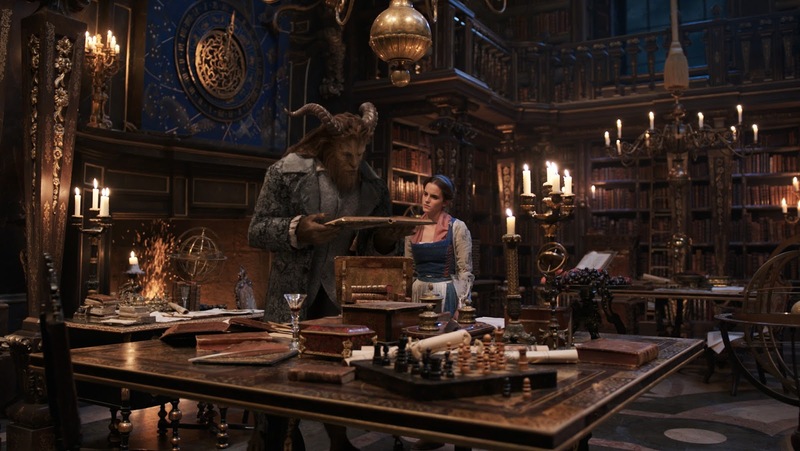 Beauty and the Beast is a beloved Disney classic that was recently remade into a live-action film starring Emma Watson, Dan Stevens, Emma Thompson, Kevin Kline and many more talented individuals. But with every remake, there is always a risk: will it live up to the original? Though the live-action film has some differences from the animated one, it still — in the opinions of Chelsea and Jenn — holds up. Below, we talk about what we loved about the original, and how the remake compares. Okay, give it to me straight: what are your thoughts on the live-action remake overall? Jenn: I absolutely loved it. The animated film is so beloved to me, and Belle is my favorite Disney princess (I mean, hello, she’s the Sacred Princess of Reading). And I thought that the remake did a really good job of modernizing the classic, in a way, while still remaining true to it. It was a re-imagination of sorts, but not a departure from the things that made the initial film so popular. Everything worked really well, I think, overall. Chelsea: Okay so, Beauty and the Beast (1991) is one of my three favorite films of all-time. I have tattoos inspired by the film planned for the future. I knew going into this live-action iteration that it would in no way compare to the original and to just shift my expectations into it being a reenactment rather than an inspired by film. Having changed those expectations the day Emma Watson was cast really helped get me hyped for the film and lead to me thoroughly enjoying this version. I loved just about every moment of it including some of the new songs and little changes they made to Belle’s backstory to help fill in the gaps. There were only a few awkward inflection moments during the recreations of “Be Our Guest,” “Beauty and the Beast,” and “Something There” that really threw me off, but I am also very attached to the original soundtrack and those slight differences were bound to throw me. What was your favorite change the live-action remake made to the original? Chelsea: I really enjoyed how Belle was even more headstrong and spoke out against Gaston and for herself. Belle was already quite the little feminist and vocal in the original, but those little Hermione-esque moments really drove home that Belle wasn’t a Stockholm Syndrome princess and was in charge of her own agency. Also, making Le Fou a character with motivation and being torn was way more interesting than him being the fool that blindly support Gaston. Disney did right by him by making him a queer character and giving him that story arc of being the tentative sidekick. I was very impressed. Jenn: I agree with Chels about Belle. I thought giving Belle the backstory of being an inventor and her father as just being the lonely man was creative. I never really liked how her father was just seen as the bumbling fool in the original film. I thought that change was subtle and small but it really helped to make Belle a more well-rounded character and her father more sympathetic. Both ended up being in charge of their own destinies, which I really appreciated. The inclusion of the Enchantress throughout the film as an outcast was also really small but poignant. I loved the fact that she played a significant role and was a widow — this seemingly insignificant person in a seemingly insignificant town had more power than anyone else in the entire film. It was great. Totally agree with you, Chels, about Le Fou’s motivation. I think I was most pleased with his arc as a person. The original film made him, again, such a bumbling fool. But that Le Fou was able to identify Gaston as a monster in “The Mob Song” was such a powerful moment to me. It really allowed him to develop as more than just a foolish sidekick, blinded by loyalty. The 1991 film had some plot holes (okay, quite a few) that the live-action film addressed. Which one did you appreciate most? I really liked that they addressed Gaston’s behavior as potential PTSD, and that the Beast was no longer an eleven-year old boy. Chelsea: Gaston’s backstory of coming back from the war and possibly having some PTSD really worked for me. They gave him some extra moments to try to rise above the villainy and it lead to some great character moments and dynamic scenes from Luke Evans. Having the Enchantress there for the entirety of the story and filling in that Beast age gap and why nobody knew about the castle were also nice little touches that only added to the story. They weren’t overt in changing the original story but they also made it make more logical sense. How was the casting of the film? Would you cast any roles differently? Chelsea: Literally everyone was perfect, I will fight people about Emma Watson. I don’t need her to be Celine Dion because her personality fits the role and she can carry a perfectly fine tune. Luke Evans was the real treat I didn’t know was there. Who knew that the villain from Fast and Furious could ham it up and sing like that? Jenn: I will also fight anyone who complains about Emma Watson. The woman has literally played two of my major female heroines (Hermione and Belle), so she’s perfect. I liked Dan Stevens as the prince. I’ll admit that I initially was worried about Luke Evans. Gaston, in the original, was so buff and that’s part of who he is (it’s even in the song — he’s “roughly the size of a barge”). But Evans was super surprising to me, because he really embraced Gaston’s personality and I think, to me, that made up for the fact that he is a bit smaller than I expected Gaston to be. He got the villain on a deep level and I really loved that. Josh Gad was the perfect Le Fou, and all of the castle characters were FLAWLESS. The music of Beauty and the Beast is iconic, and with the inclusion of new songs, the remake had the chance to soar or fail. How would you grade the musical elements of the film? Chelsea: I’d give the new songs a solid B. There was no way they could add new songs around these iconic ones but they did a perfectly fine job at adding new things to keep the pace of the film. Props to them for getting Celine Dion back to sing one of them. I do love that they managed to get Audra McDonald to sing more than I thought she would. Her rendition of “Beauty and the Beast” with Emma Thompson was delightful. Ewan McGregor cannot really sing though. There’s no good way around that one. They needed that to be a James Corden type of actor that can be fun but also belt it out when needed. Ewan was the clear weak link in the cast. Jenn: I might skew it a little higher than you, Chels, just because of how much I love “Evermore” and have had it on repeat. The new songs might not be iconic, but I don’t think they were out of place, which is all you can ask for whenever you have original music in a film. I loved Emma Thompson singing “Beauty and the Beast.” And Dan Stevens was a surprise, because he did a great job. I love Emma Watson but I wish they hadn’t autotuned the crap out of her. She sang “How Does a Moment Last Forever (Reprise)” live apparently, and it didn’t sound bad. That’s my main complaint with the music. She’s not a bad singer and Belle doesn’t have to be a master-class performer, but the film didn’t even let Emma Watson try without over-tuning her voice. Be honest: did you cry? At what parts? I also honestly got a little weepy when the servants changed into the household items (seemingly) permanently. Belle’s song at her childhood home also tugged at my heartstrings. All of the girls I went to see the film with sat together, with the boys on the end, and you could see us wiping back tears during several parts. Chelsea: During almost every song but for good reasons. Just the great production value and seeing those iconic moments with Emma Watson as Belle really were a joy to watch. The end portion where the last petal falls and the Beast briefly dies also got me good. Jenn: Chels, that last petal falling wrecked me too. Is there anything else you’d like to add that you enjoyed about the film overall, and/or wish had been done differently? Jenn: Mad props to the costume designers on this film. That yellow ballgown is iconic, and I love the way that the film modernized it and yet still stayed true to the original. I want Belle’s earcuff in that scene and her hairpiece, too. Like, now. Like, link me in the comments if you’ve found it on Etsy or something. Overall, I really enjoyed all the little nuances in the film that I’ll have to appreciate more in a re-watch. The music is still as iconic and enjoyable as the 1991 classic, and I felt like a child watching the magic of the film unfurl in front of my eyes in new ways. The story is still just as beautiful and the message about loving yourself and loving others for who they are on the inside is just as necessary in this day and age as it was then. 10/10 would see (and will see) again. Chelsea: I’m so happy this film is making all the money. I’m generally hit and miss about this remake culture but I really feel like the right care was put into this one and that it all came together pretty nicely. From a filmmaking standpoint, I thought everything was beautiful and that I was transported into that cartoon from my childhood. The cinematography, production design, and wardrobe were gorgeous. The cast really had fun in their roles and they knew they weren’t there to make anything more than the original. I think a better director could have saved some of those musical numbers from being as awkward as they were but Bill Condon has proven he can deliver a hit, so who am I to argue with his hiring. I know I’ll be seeing this again in the future and it’s something I can take my nieces and nephews to see that is fun and not a dumb animated film like The Secret Life of Pets or Minions.